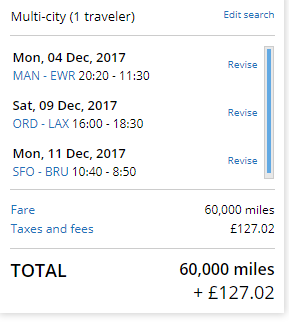 I posted a few days ago about how until 12th November 2017 you can buy United MileagePlus Miles for between 0.84p-1p per Mile. I ended that piece by saying I’d share some thoughts on how to get massive value from those Miles, so here’s Part 1 of the lowdown on United MileagePlus sweetspots. The first thing to say is that United just had a devaluation last week, so a lot of the prices you’ll see elsewhere on other blogs are now out of date. 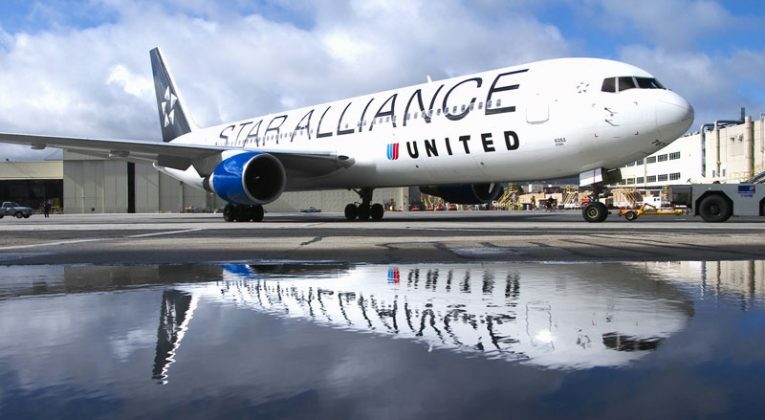 You can check out the new award charts here – note that MileagePlus has different pricing for using Miles on United flights than it does for redeeming with Star Alliance partners. 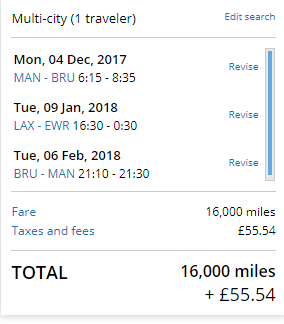 When you search for award flights, MileagePlus will quite often throw up routes and pricing that seem a little surprising. It’s not uncommon to see results come up that include connecting in a region outside of the two regions you are actually travelling from/to – and the crucial point is that the amount of Miles required isn’t necessarily any higher despite the fact you are going through a region that would otherwise require more Miles to travel to. Say, for example, you would like to fly between Addis Ababa and Lisbon, you would normally be charged 30,000 Miles in Economy and 55,000 in Business Class, as according to the regions list that’s Central/Southern Africa to Europe. Forget everything you know about how award tickets normally work – it’ll only serve to confuse you here. The Excursionist perk is plain weird, just accept it and enjoy the benefits. 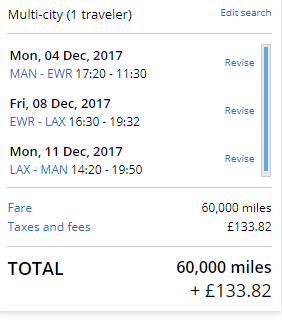 As you can see, the itinerary above is Manchester to New York, staying there for a few nights, then continuing onto Los Angeles (also staying for a couple of nights) and then flying back to Manchester. What is interesting is that the New York – Los Angeles leg prices at zero Miles. At its most basic level, the Excursionist perk allows you to add on a free one-way within the region you’re traveling to, when you book a Return flight (use the multi city search function on the United site to add the free intra-region leg in). That’s useful, but it gets a lot better (and weirder!) than that. That’s all I’m going to say for now as I don’t want to overload anyone, but I’ll be moving onto the really good (if slightly advanced) stuff very soon! Nice one Joe. Looking forward to the advanced version. That last example is quite interesting to say the least… 😀 I used to do stuff like that with the old ANA total miles flown award chart. Ta – if you’re not familiar with MileagePlus, the advanced version will be a revelation! Does this work for business flights too? The cheap 8,000 miles each way is Economy-only. But I’m guessing you could do the same thing in Business, but it would cost a lot more miles. Cheers! – if you liked this, you’ll love the next part. Fantastic post – wheels are turning in my brain now at the possibilities! Cheers! – soon (next day or 2), I might turn this into a 3-part rather than 2 as it can get a little tricky. It seems to me that one issue is: What is the cheapest (in miles terms) First Class flight that can be booked intra-Europe, so that the Excursionist (free) leg can also be in First? Superb question, and not one I’ve given proper consideration to just yet! – the other trick would then also be to find the best/longest First Class flights within another region too to make it worthwhile. Thanks, and of course, maximising the free leg is the other end of the equation! I’m thinking one possibility on an Asia holiday could be e.g. an internal Japan flight in First – assuming such a flight exists (16k), then a more substantial excursionist flight in First (eg Thai First ex Bangkok) within South Asia (normally 40k but here free). Presumably the final leg would need to end in Japan, but this could be an Economy internal Japan zone flight (possibly 5k) which is never actually boarded, unless I am missing something? Exactly right in terms of the thinking – the practical issue is finding the right routes as you say. Thanks Charles – don’t worry, I’ll definitely get it published before then! The problem with the last screenshot is that it’s good only if you actually fly the first segment. You might have to be careful if you are suggesting people can skip the first segment as many airlines would not allow the rest of the ticket to be valid. Hi SPK – no don’t worry, nothing like that is involved! You always have to fly the first segment of any itinerary, as you say. The question would be more ‘why would you want to skip it anyway?’ – with a bit of planning you could ‘nest’ trips and build some incredible value. I think a number of American readers would be quite interested in nesting the cross-country U.S. flight within some cheap 8,000 mile flights. But as you say, two halves of weekend getaways or a “ex-EU” positioning is great value for Brits so we’d be unlikely to want to just skip that first flight. True – though for many US readers they’d actually be better off using intra Hawaii flights which are still just 5k and basically no tax I think (assuming they were going to hawaii), or could mix things up with trips to Mexico/Caribbean/Central America etc if they wanted visit any of those places (though the Miles required is a bit higher). Excellent point re ex-eu positioning for cheap Qatar etc flights! – I’d not really considered it from that angle yet, but for ‘highly advanced’ level travel hacking that could be a great move.